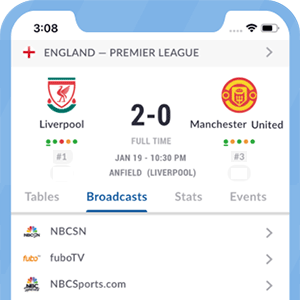 Univision Deportes en Vivo offers soccer fans access to live streaming and video highlights through the website as well as the Android and iOS apps. Univisión Deportes Network (UDN) is the dedicated sports channel operated by the largest US based Spanish-language television network Univision. The channel reaches approximately 40 million viewers in the USA. The Sports network which is headquarters near Miami, Florida launched in 2012 and broadcasts in both 1080i (HDTV) and 480i (SDTV) formats. The channel's overflow feed is available on Univision Deportes Network 2 (UDN2). The channel is available in the United States and Puerto Rico on major cable, satellite providers. In addition UDN is also available via OTT services such as fuboTV and Sling TV. Programming on Univisión Deportes Network is dedicated almost entirely to live soccer matches and related soccer programming targeted to US Hispanics, Latinos and Mexican Americans. The channel features matches from Mexico's Liga MX, Copa MX and live friendly and competitive matches of 'El Tri' - the Mexican National Team. Liga MX matches are limited to those of the following Liga MX teams: América, Chiapas, Cruz Azul, Guadalajara, Monterrey, Puebla, Querétaro, Toluca, UANL, UNAM and Veracruz. In addition to this, matches from other leagues such as the Portuguese Primeira Liga and the MLS (Major League Soccer) are also shown due to high profile Mexican players playing in those leagues. Univision Deportes Network will also play a major role in broadcasting the 2016 Copa América Centenario in the USA this summer, with plans to live broadcast all 32 matches of the event. Univisión Deportes Network is available on various other TV providers. For specific local UDN channel numbers, please verify here. *Got itLive Soccer TV does not provide Univision Deportes En Vivo live streaming. The information provided on this page is simply Univision Deportes En Vivo soccer TV schedule.